Anyone get the license plate number of that Spurs’ truck? These are some things I was thinking about during Tuesday’s Bulls/Spurs game: If a mime is arrested, are they told they have the right to start speaking? If I loan someone $20 and never see them again, that has to be money well spent. How do deer know to cross the road by those yellow signs? And if Jimmy cracks corn and nobody cares, why is there a song? I was thinking of those things because, wow, was that the opposite of an interesting basketball game, the Spurs’ 104-96 win over the Bulls that was disguised as a competitive final. “We got our (tushies) kicked,” observed Joakim Noah, who had 13 points, eight rebounds, seven assists, two blocks and many, many frustrations. At the end of the first quarter it was 16-14. Not bad, really. 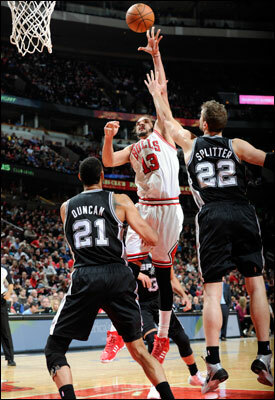 Except that was 16 for Tony Parker and 14 for the Bulls as the Bulls closed to within 38-14 after the opening quarter. The Bulls then made a run to cut their deficit to 21 points by 19 seconds into the second quarter before the Spurs then hit the Bulls with a 13-2 shot behind a pair of Manu Ginobili threes to lead 51-19 with 7:33 left in the first half. Fifty-one to nineteen! Yes, that deserves words because it was so startling. Really, these guys just beat the Miami Heat like they did on national TV? For the benefit of someone who actually looked this up, it was the 12th worst first half in Bulls franchise history. The Bulls never have won trailing by at least 28 at halftime. In case you were wondering. Sure, you can find all sorts of reasons for a game like this for the Bulls, the old letdown-after-the-big-win theory of the Miami victory Sunday being the most popular. Though Bulls coach Tom Thibodeau, as one might expect, didn’t much accept that one. “Thirty eight to 14, 61-33 at the half. Readiness to play; that’s the biggest thing,” said Thibodeau. “Like I told them, it’s completely on me. My job is to have them ready. We had no edge to us. That’s a championship caliber team playing on all cylinders and they’re going after it. If you don’t match that intensity to start you are going to get in a big hole. I didn’t prepare them the way they needed to be prepared. Look, sometimes you are the bug. You can have a heck of a buzz going and then just, splat! No, it wasn’t the best this Bulls team has played. But they didn’t quit and they didn’t lie down and they did try. But the Spurs, led by Parker, were simply amazing to start as they won their seventh straight with having their full team together for just the last few weeks, 13 of 16 with the league’s best road record and, by the way, the best record in the NBA at 47-16. Not that the Bulls, now 35-29, can’t play with a team like that sometimes. They defeated the Spurs in San Antonio back in late January. But this was remarkable shooting by the Spurs, advanced teamwork, the sort of basketball clinic the Bulls can put on defensively with pressure, help, fighting over screens, trapping and recovering, making every shot and move contested. Teams just don’t do this to the Bulls. At halftime trailing 61-33, the Bulls didn’t have a single second chance point and were being outrebounded 22-14. Someone on the Spurs watched some tape of Bulls games. The Spurs still were shooting 61 percent and 70 percent on threes at halftime after 71.4 percent in the first quarter and 80 percent on threes the first 12 minutes. It was hardly the Bulls at their best, obviously, as there were some unusual breakdowns, like Kawhi Leonard with 16 points driving in from the right wing untouched for a slam dunk, Ginobili getting an open three on an inbounds pass, Marco Belinelli with 10 points with open threes in transition and Parker with 20 points and nine assists in just over 24 minutes. But Kirk Hinrich was bumping Parker and pushing him and trying to go over screens and cut off Parker, and Parker was simply terrific. Sometimes a guy does that and you just have to admit he was too much for you that day and they were the better team. The Spurs were. They are better than the Bulls. It takes the kind of effort and efficiency the Bulls can bring out to beat them. The Bulls have shown they can do that. Not that often, however. “They’re a great team, championship team,” said D.J. Augustin, who led the Bulls with 24 points. “Around this time they are making their push for the championship. We felt like we were ready; we were fired up before the game. We weren’t thinking about that Heat game anymore. We were on to San Antonio. They just came out and jumped on us and we couldn’t match their intensity. Augustin was in a group with Nazr Mohammed, Tony Snell, Taj Gibson and Jimmer Fredette, the latter with five points in 7:47 and some effusive cheers from the United Center sellout, who got it within 10 with two minutes left. But there wasn’t enough time to come back from trailing 96-68 with 8:54 left in the game, though a Jimmer three with 3:40 left got the Spurs lead to 100-87 and the fans clamoring loudly for “Defense!” But Popovich and the starters sat there and it would have been difficult for the Bulls even to get to 100 at that point. “Not that the Bulls, now 35-29, can’t play with a team like that sometimes. 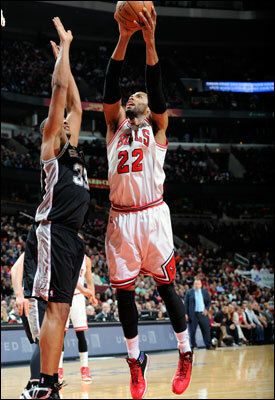 They defeated the Spurs in San Antonio back in late January,” notes Smith. “They were whupping our tail from the very beginning,” acknowledged Butler. “They were the more ready team than we were. We just came out stagnant, a few turnovers, not making shots. That led us to not playing the type of defense we normally play. I felt like that was the biggest key. Undoubtedly, the Bulls will be, though that hardly guarantees a win over another of the league’s hottest teams, the Rockets. But one thing about these kinds of losses that happen occasionally to the Bulls: Thibodeau offers a glimpse of the kind of messages he gives to his players, what he expects of them and why they are so successful despite the limitations on overall talent. “Great lesson,” Thibodeau said almost gleefully as this kind of loss opens the door to more preparation and attention to detail. “You have to learn about that game (you played), what did you do well, how did you win and then get ready for the next one. And then you are sitting there and you’ve got another team similar, deep, edge, playing great. They’re strong on both sides of the ball. It’s true the Bulls didn’t do that as well as they often do and as well as they can do. You suspect they’ll do so Thursday against the Rockets. Which is why nights like this aren’t all bad. And, hey, the fans got to witness Jimmer’s first Bulls points with a three pointer. So why does the doctor leave the room while you take your clothes off and then examine you while you are naked? And if pizza is round, why is it always in a square box? By the way, are the Bulls still down 30?